By this point you've no doubt heard about employer branding and how important it is for finding the right talent, and it's true. A strong employer brand will not just give you more candidates to choose from, but they will be a better cultural fit. But did you know that having a strong employer brand will also drastically reduce your acquisition costs? According LinkedIn, having a strong employer brand can reduce recruiting costs by 43%! So how do you go about developing your company's employer brand? In short, an employer brand is how you market your company to job seekers. Let's break that down a bit further, shall we? An employer brand showcases how your company is unique by highlighting things like culture, employees, work environment, benefits, work-life balance, company values and anything else that makes your company an ideal place to work. As we said earlier, the importance of a strong employer brand has far reaching effects on the health of a company. In fact, it's one of our top recruiting trends to focus on in 2019. As a marketer or recruiter, it makes your job considerably easier. In essence, your employer brand is a product, just like that which any consumer would buy. Except in this case the consumers are job seekers and the product they are buying is working for your company. Consumers buy things out of need, pleasure and influence. Have you ever heard a friend talk about a great perk they get through work and say, "wow, I wish my company did that!" This is an example of employer branding. Because your friend, the company's employee, was satisfied with an aspect of their job, they spread that message to another person. That person now becomes interested in working for that company because they see how happy other employees are. The above scenario is a downstream effect of developing your employer brand. So how do you get there? A natural place to start is to examine where your employer brand is currently. If you are hiring employees who are a great fit, who are happy, performing and staying with your company, your employer brand might be exactly what you want. In that case, focus on more meaningful ways to connect with your audience. But it's always healthy to conduct an audit to see if your company's values are matching those of the employees. What attracted them to your company? Did your recruitment marketing speak to their values? What could you have done better in their recruitment experience? Does your employee feel their experience with your company was exactly as advertised? Interviews or surveys of candidates who decided not to accept job offers are also a great way to gauge how your company is perceived. It can give you valuable feedback on what attracted them, but ultimately what led them to pick another company. To state the obvious, yes, it is important to hire somebody who possesses the skills, or at least the ability to learn the skills, required of the position you have open. You're not going to hire somebody who can't perform. But hiring somebody who will fit into your company's culture is just as important. Google has one of the strongest employer brands in the world. They attract a certain type of individual who fits their culture. Here is a great example of an employer brand video they produced. What do your ideal candidate value? What traits do your current best employees possess? What are your candidate's goals? What are your candidate's motivations? What traits don't you want in a candidate? Use your employee persona to craft any kind of content that will influence your candidates (we''ll dive deeper into this below). Lay out the ideal candidate traits in job descriptions. Speak to their values in paid ads you create. Speak to this persona at every stage of your recruitment funnel. Marketers understand the importance of content to deliver their messages. The same is true for recruiters. Utilize content marketing to help showcase your employer brand to your candidates. It will help your company appeal to their values and their desires in ways that a simple job posting won't. What types of content should you use? Well, there are many options for you on this one. Just like a financial portfolio, look to diversify. Use your company social media accounts to deliver information that your ideal candidate will enjoy. The use of video is crucial. It allows you to humanize your company in a way that makes candidates picture themselves not only working at the company, but working with people they would fit in with. 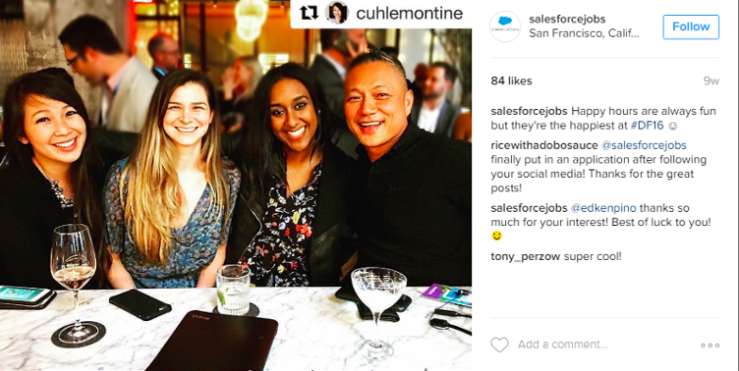 Here's a great example of Salesforce using social media to showcase their employer brand. Check the comments! Make your job postings on your website interactive. Instead of the typical bulleted list of requirements and desired traits of the ideal candidate, have the hiring manager produce a short video introducing themselves as the person the candidate will be reporting to. Outline the duties of the job and what the candidate can be expected to take on day-to-day. It can't be stated enough that every bit of content you produce should have your employee persona in mind. Looking to find more candidates on Facebook? Download our free Facebook for Recruitment Guide.